Inspired by surrealist paintings, these short stories are filled with allegory, as well as detail that adds layer to the original work of art. In Domestic Disturbances, Peter Grandbois crafts a series of stories that describe strange occurrences in decidedly normal settings. Grandbois based much of this collection on the paintings of the Clayton Brothers, whose works usually combine bright, almost art-deco colors with surrealist imagery. Grandbois adds a layer of backstory to these images, and this creative exercise produces a collection of well-written vignettes. For readers familiar with the Claytons’ work and style, Domestic Disturbances can function as a series of imaginings, telling the stories behind the paintings. “Appliances,” inspired by the painting on the book’s cover, serves as a good example. 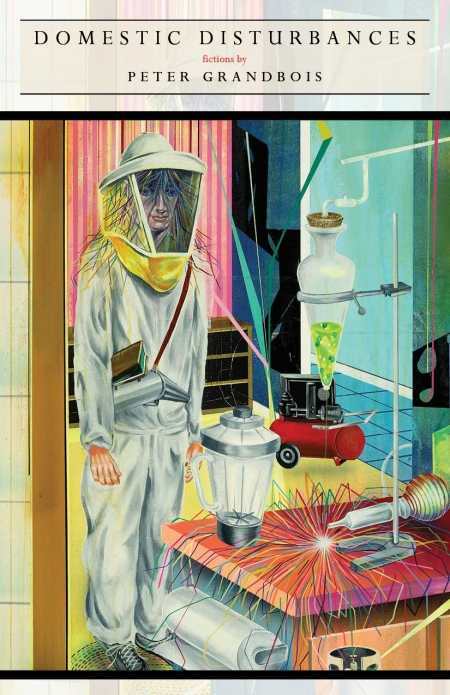 The artwork shows a man in a beekeeper-style suit, surrounded by a mix of everyday appliances and brightly colored wires. Grandbois turns this man into a single father caring for two young daughters and provides him with an unusual daily routine in a house full of dangerous electricity. Those readers unfamiliar with the artwork that inspired the stories will find that the shorts function as surreal mood pieces, more like snapshots of odd situations than full narratives. Grandbois commands his language and imagery very well, painting verbal pictures that allow readers who’ve never seen a particular Clayton work to render a close approximation in their head. Grandbois works not only with slice-of-life settings—a laundromat, a school bus, a bathroom with a leaking toilet—but also with unreal activities like a man threading a needle through his own head (“rumors persist of vast asphalt deserts littered with the bones of those who tried and failed”) or a middle-aged woman ironing everything in the room, including her husband (“she found it so much simpler to smooth him out once he was dead”). “School Bus,” one of the longer pieces at the end of the collection, goes seat by seat through a bus helmed by a mad-dictator driver, with vignettes giving a story to each child, from a girl who might have an octopus on her head that fires ink at other children, to a bearded boy fighting a snake. The best pieces, however, are the shorter, succinct ones that make up the book’s middle section. Ranging from one paragraph to a few pages, they fittingly function as little works of art in their own right.